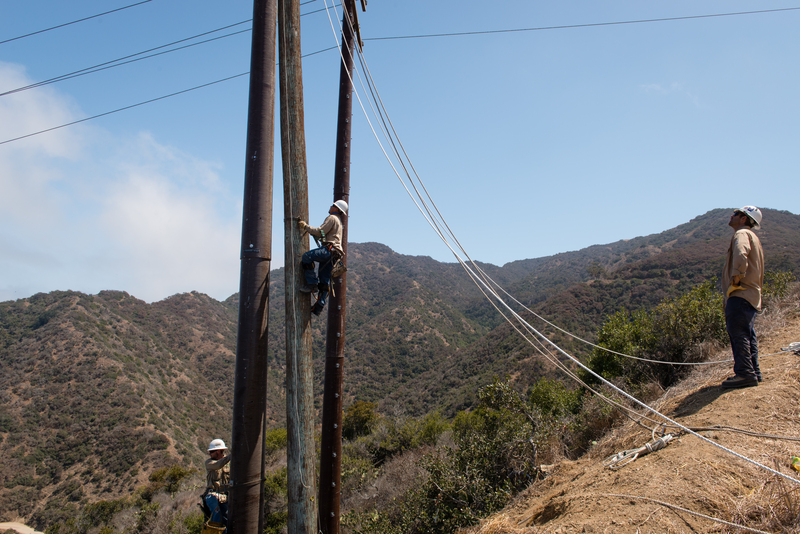 SCE is working to replace wooden poles with composite poles to make a more resilient system. A lineman works to replace a wooden pole with a composite pole. SCE Air Ops pilot Brad Bohlmann looks down during a pole set on Catalina Island. Linemen work on a fire-resistant composite pole. Composite poles are set on Catalina Island using a helicopter. A lineman works on a composite pole. 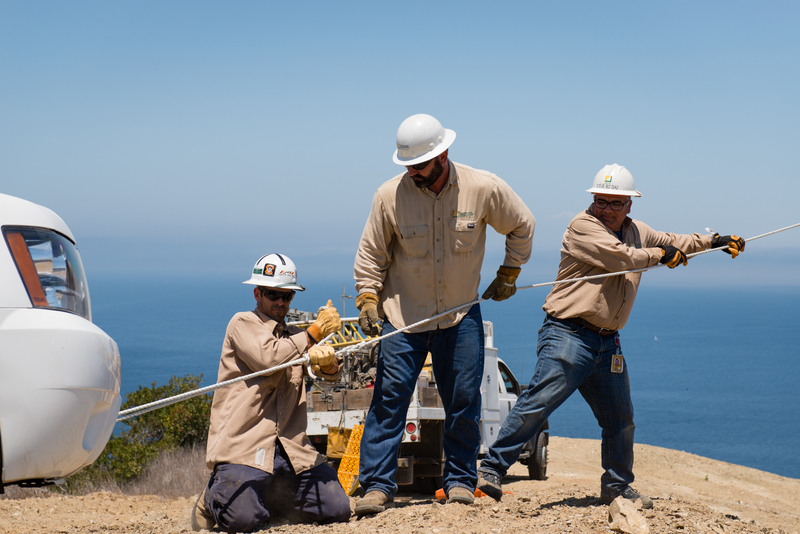 The Santa Ana crew works to set a 65 foot composite pole on Catalina Island. AVALON, Calif. — It’s 6:40 a.m. and the streets are quiet. 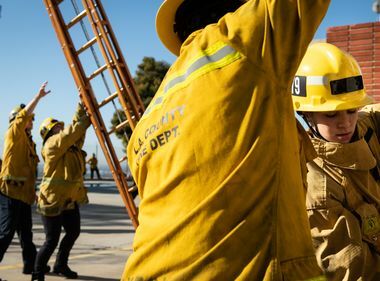 But in the back parking lot of a Catalina Island restaurant, three five-man Southern California Edison crews and support staff are starting their day with the first of several safety discussions. 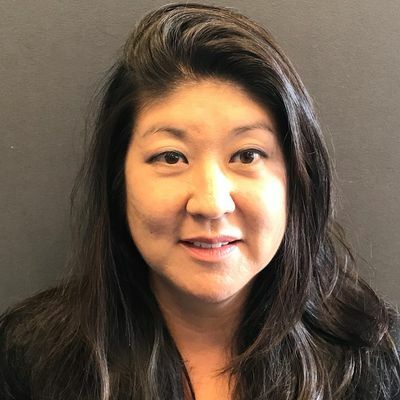 Their work assignment today: set two new fire-resistant composite power poles, 75 feet and 65 feet each, on the side of a remote, rugged mountain with the help of a helicopter to improve the resiliency of the utility’s grid. They will also need to cut and take down the wooden poles for eventual disposal. Today’s crews include the Santa Ana, Huntington Beach and Catalina Island crews. Since July 2, 85 employees from across SCE’s territory have been working to help install 67 fiberglass composite poles on the island. 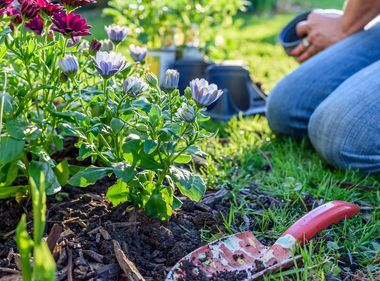 Similar work is taking place in about one-quarter of the utility’s 50,000 square miles of service territory in high fire risk areas. By mid-morning, the buzzing sound of an A-Star helicopter’s rotor blades becomes increasingly louder. The Huntington Beach five-man crew, having hiked up the steep hill, wait to receive the new 75-foot, 1,800-pound composite pole that will be lowered on a line with a remote latch. As the e-crew foreman talks to the pilot via radio, the pilot sets the pole in a pre-dug deep hole. An SCE truck is used to help straighten a fire-resistant composite pole. As the fiberglass pole is lowered, the crew grabs the tag lines to steady the pole in place. A lineman signals to the pilot that he is good to safely fly off. The crew then backfills the hole with rocks and dirt to pad down and secure the pole. With safety belts secured, three lineman climb the wood pole to transfer the 20-foot crossarm, conductors, insulators and eventually the 12 kV wires to the new pole. As a chain saw is roped up to the crew, the pilot returns to help remove the wood pole by first lowering a line with a remote hook that is attached to the pole. 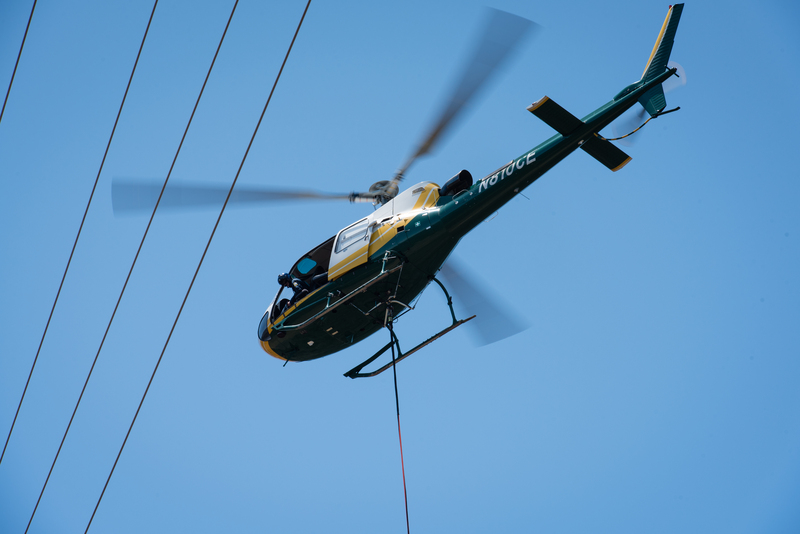 With precision timing, the lineman cuts the first section of the wood pole and when safe, the helicopter lifts it up and flies it to a laydown yard where it will be prepped for disposal. The same trip takes place two more times till the wooden pole is removed. The crew then begins prepping the new composite pole, first by installing metal steps 18 inches apart so the crew can climb up the pole. The fiberglass material requires different restraint belts as the crew installs the insulators, crossarm and conductors. A total of 67 fiberglass composite poles will be installed on Catalina Island by early September. Down the hill, across a dirt road to another steeply rugged hill, wait the Santa Ana five-man crew to prep the 65-foot, 1300-pound composite pole. 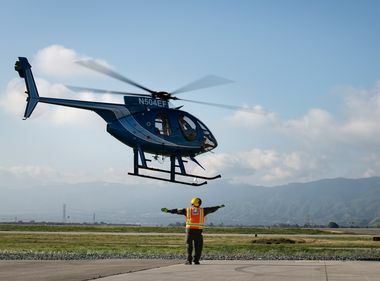 As the helicopter flies in to help set the pole, threading it between the lines of wire, the crew uses the taglines to steady the pole in place. But this time, the pole is not leaning as straight as the crew would like. They work to quickly come up with a solution. Using three SCE trucks, they tie the tag lines to the vehicles to help pull the pole straight. Within 10 minutes, the crew has what they want and the transferring of the conductors and insulators takes place. The wires will be transferred to the new pole the next day. “These composite poles are fairly new to us, we haven’t set a lot,” said Damian Spampinato, e-crew foreman with the Santa Ana crew. “The difficulties come with the positioning and the crew working in a limited space. The composite pole-setting project on Catalina is scheduled to be completed in early September. 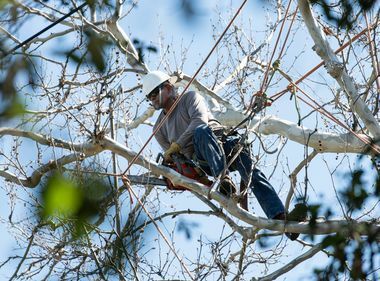 Similar efforts continue throughout SCE’s territory and these same crews and their colleagues will be called on to complete that work.